UNION BAY STINKS…………BECAUSE OF THE GENERATIONS OF THUGGISH BEHAVIOUR. All of the incidents below are related to my criticism of the Union Bay Improvement District Board from 2007 till 2011. The friends and relatives of those I criticized thought they could bully me into shutting up. Everyone who allows this crap to continue is endorsing the behaviour by being silent and cowering to these thugs. 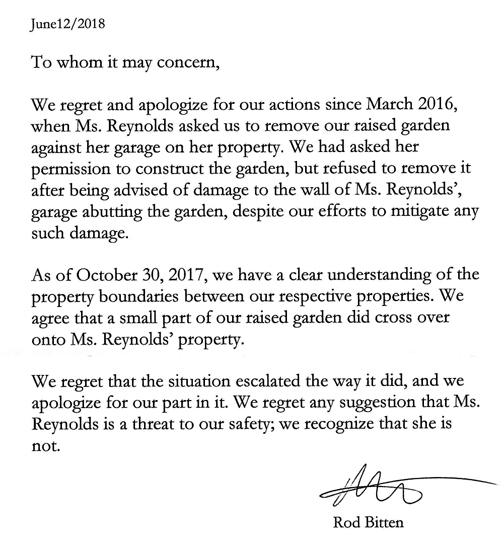 The following incident took place as I was removing firewood from a piece of property co-owned with another landowner as the property was being sold. Dan McGill, Water Superintendent with the Union Bay Improvement District, was renting the other half of the property co-owned with another landowner and paying rent to the other owner. Dan was well aware what portion of the land he was renting as I had to get his landlord to ask Dan to remove his truck and items he was storing on our side of the property. Dan McGill had Jamie Barckley and Rachael Day along with another female as drunken guests. Jamie Barckley took it upon himself to approach and harass me. Dan McGill actually said that I should have given him notice to come on the property – I reminded him we did not have a tenancy agreement. This is Rachael Day who was a secretary to my lawyer who was handling my divorce proceedings. While Rachael and her female friend harassed me while I was loading the wood on my property, Rachael reminded me of who she was as I didn’t recognize her. She told me how she knew all about my case and how my husband was trying to screw me out of money. I hope Rachel Day isn’t working in a position where she has access to confidential personal material. At one point Dan McGill approached me and said he had called the landlord who was arriving and would I wait. I waited and it was the police who showed up. Dan McGill intentionally led the police to believe he was a tenant and that I as a landlord would have to give notice prior to arriving. Dan McGill is still employed by UBID. I provided the police with the full video and audio of the incident. Police didn’t do anything. Jamie Barkley is the nephew of Union Bay Improvement District Water Works employee Keith McKay. Jamie Barkley has been hired numerous times for part time work at UBID when the job was not posted or offered to anyone else. Jamie Barkley is the nephew of Lloyd McKay (brother to Keith McKay) who grabbed my camera when the strap was around my neck and yanked so hard that my glasses fell to the ground. Police didn’t do anything. Another occasion Jamie Barkley stood in the middle of the road and refused to move when I was driving down my street. He walked right up to the van and then punched the driver side window. Police didn’t do anything. For anyone who doesn’t know who Alan de Jersey is, he was a Trustee on the Union Bay Improvement District who unlawfully locked out the electorate while a water deal was being secretly negotiated with Kensington Island Properties in 2011. He is also a retired RCMP officer. Shouldn’t he know better? 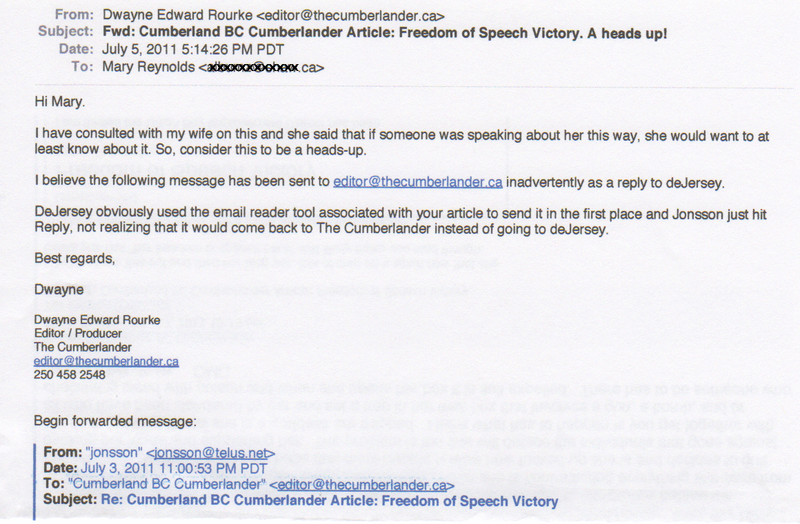 The following email exchange of Alan de Jersey and his female friend Kim Jonsson was sent to me by the publisher of The Cumberlander. I only published it after Dwayne moved so he wouldn’t take any heat. When I hinted to de Jersey that I was in possession of such an email he called me a liar and coward. Haven’t heard anything from him since this was published. It will stay on my blog till I croak. 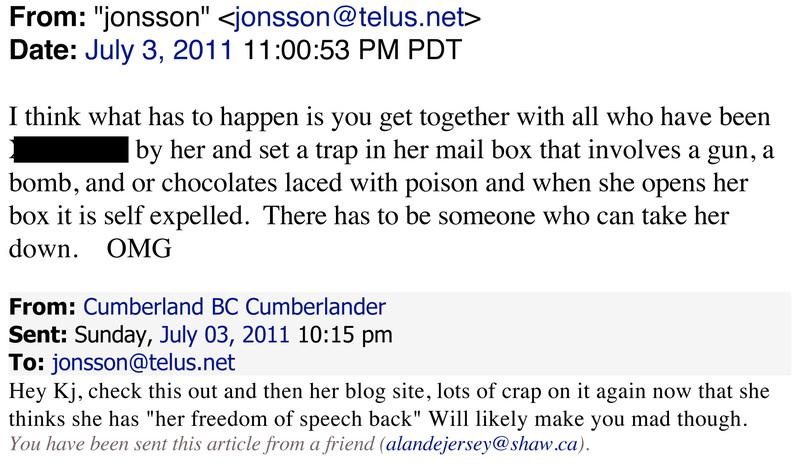 Alan de Jersey’s friend, Bryan Baker of Comox, sent me an anonymous filthy email calling me a c**t, and when I offered $100 to anyone who knew the ip address, Bryan Baker admitted it was him and wanted the $100. So this is what Alan de Jersey’s friend did to defend him. http://maryreynoldsunionbay.blogspot.ca Bryan Baker mentions the Cumberland Rotary because at the time Alan de Jersey was the President of the Cumberland Rotary. There’s more, but you get the drift.